Through The Mailbox, on to the canal, under Broad Street, past Brindley Place, Bank, Bannatyne’s Gym, up steps on to Sheepcote Street, down a side street, over a bridge, and you get to Ju Ju’s Cafe. You could definitely say it’s well hidden, even though it’s just fifteen minutes walk from the centre of town. The fact that it is a bit out of the main drag, but is so very popular, is testament to the super offering that the owner and maitre d’ Julia has lovingly created here. I like that it’s styled as “cafe” rather than “restaurant”, don’t let that fool you in to thinking this is freezer to table slop. It’s fresh prepared food, in fact Julia said that the only things she freezes are the ice, ice-cream, and the peas! It’s a relaxed environment where you could wile away an hour or two over a coffee, or a bottle of wine, with friends. Two sides of the air-conditioned venue overlook the canal and there is plenty of outdoor seating for those who want to top up their tan. On a hot summer’s evening we enjoyed a walk along the canal that ended in a dinner at Ju Ju’s. I always enjoy watching the goings-on of the waterways and this is a perfect vantage point. We watched countless cyclists and sweating runners pass us, and of course the narrow boat dwellers about their business. First thing on our agenda was a pint of Peroni to cool us down. There isn’t a big wine list but the essentials are covered, and there’s cider, lager, beer, spirits, and a few cocktails to boot. 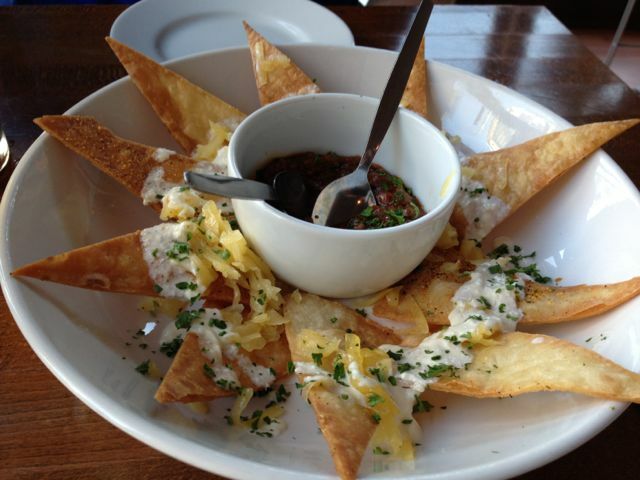 For starters we had the nachos to share, with a beef chilli. The nachos were, of course, of the home made variety. They were crisp and fresh and presented nicely as sunburst rays around a bowl of chilli – thus the nachos didn’t go soggy with topping. 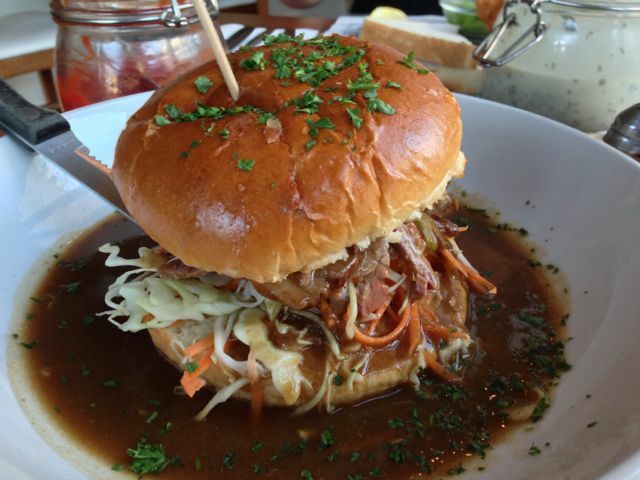 For mains, I had the home-cured salt beef which came on a brioche bun with mustard, house coleslaw, gherkins, white cabbage, and carrots. It’s served as an island on a plate of absolutely delicious gravy, with a side of twice cooked chips. We also went for the fish and chips. They were served on a glass chopping board, by now you know my feelings on non-plate platters, but I really couldn’t hold it against them for a minute given the quality of the fish, chips, mushy peas, and home made tartare sauce. 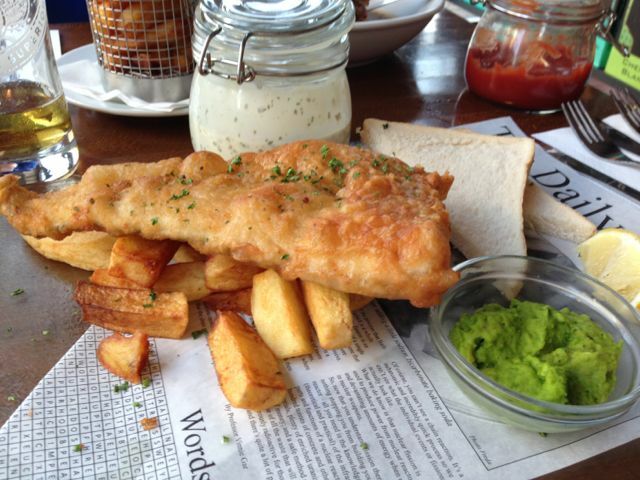 The batter on the fish was delicate and golden, and the chips reminded me of my Nan’s. As an added bonus there was buttered white sliced bread for the obligatory and indulgent chip butty! The crowd eating there was very diverse and I can see why it appeals to such a wide audience. The prices are very reasonable (we paid £22 a head for two courses with a couple of beers each), the background music good and at a volume to hold a conversation, and the host welcoming. You could go here as a couple, with your parents, or with a group of friends, and have a delightful time. Thanks Julia, and the rest of the cheery folk at Ju Ju’s, for a lovely evening. 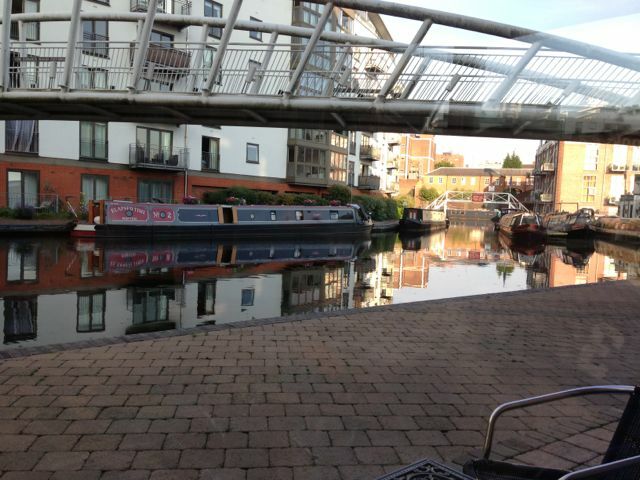 This entry was posted in Area: Brindley Place, Area: Broad Street, Cuisine: English, Cuisine: Modern Mixed, Price: Average, Price: Cheap as Chips - Inexpensive, Venue type: Bar, Venue type: Cafe, Venue type: Restaurant. Bookmark the permalink.